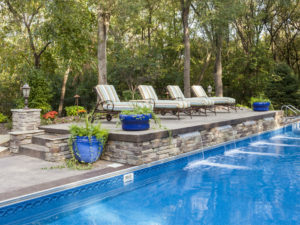 Once you have made the decision to seal your pool coping, you may not know where to start. This may seem like a job for a professional, which it can be if you are unsure, but it can be done at home! We promise that it is not nearly as daunting as it seems. In order to help you through this process, we have created this blog to walk you through it. Before you begin, keep in mind that each of these directions is meant to be followed closely. If you encounter a substance like mold or mildew, don’t proceed. This needs to be professionally removed before proceeding with this process, or else you could be sealing it in and ruin your pool coping anyways. Follow the steps in the right order. You will need to lower your pool’s water level. This way, the portion of the pool coping you are working on won’t be wet or moist as you work. Water could ruin your progress. Now you will need to think about whether or not there is old sealant on this surface. You, or someone else, might have applied this in the past. 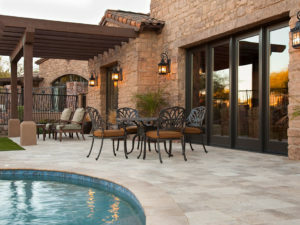 If your pool coping has been sealed before, you will need to remove it. You can do this with a cleaning product that is specifically designed to remove sealant from surfaces. Use this product to sit on the surface for a little while before agitating and then rinsing away. Make sure that there are no calcium deposits. If there are, they will need a professional soda blasting to remove them. If you have just installed new tile, you will need to let your grout cure first. This means giving it 24 hrs or more to fully settle before attempting to seal it. This process will take longer in humid environments. Clean your pool coping. You can use a professional cleaning solution with a neutral pH or something more acidic for heavily stained surfaces. Rinse when you are done with step five. You can use a hose, bucket, or mop for this. If you have a pressure washer, you can use this as well, but make sure it will not damage the surface. Remove excess water. Use a vacuum, cloth, or a squeegee. Be careful not to leave water on this surface to evaporate because some of it will sink into your surface. Get rid of all oil stains. You can use a commercial grad cleaning solution for this, and make sure you choose one that is recommended for the surface you are cleaning. Make sure the product completely dries before scrubbing, cleaning, and drying it away. Now you may apply the TSSPro Sealant of your choice. Follow the instructions on the label for the best results. What if you don’t want to do it at home? If you decide that you would rather have a professional perform this process, you can get into contact with Texas Stone Sealers for full service. Their website is located here. Do you have questions about which sealants we recommend for you? Call us at (888) 958-0556 for more information about your sealant needs. You can also fill out our contact form here.